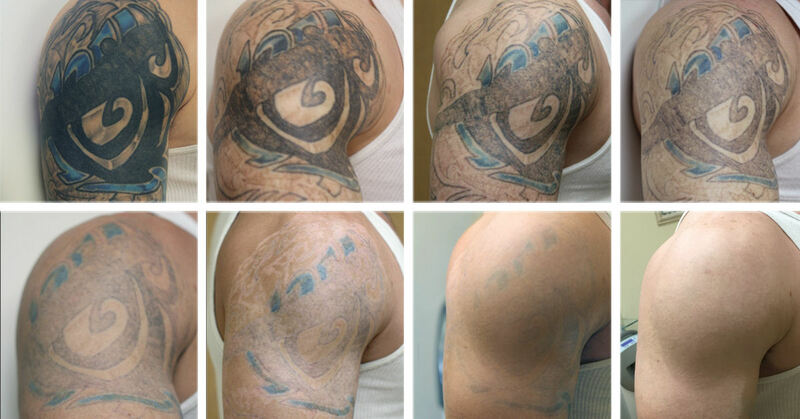 The tattoo removal laser treatment may create a superficial burn wound. Some patients may experience bruising or swelling. There is immediate whitening of the treated area, which usually lasts for several minutes. Many clients then develop blisters, crusts, or scabs within 8-72 hours, which may last for 1-2 weeks or more. The treated areas may be pink or pale after the scab separates. Scarring, which can be hypertrophic or even keloid, can occur but is very rare. Loss of skin pigment in the treated area can occur, and is temporary except in very rare cases. Healing is usually complete within 4 weeks, although this may vary. Keep the treated area clean and dry while it is healing. Clean the area gently with soap and water and then pat the area dry. You may apply a thin coating of antibiotic ointment up to three times a day for 3 days while the area is healing and you should keep the area covered with a sterile dressing for those 3 days. Blistering is common and is likely to occur 8 hours after your treatment. Do not be alarmed, blisters heal very well and are part of the normal healing process. Blisters indicate your body’s immune system is healing the area and beginning to remove the ink from your tattoo. It is natural for blisters to pop, and this helps the skin to heal faster in many cases. Continue to put antibiotic ointment over the blisters once they have popped for at least 24 hours. Do not pick as the scab or allow the skin to become scraped, as this may result in infection and scarring. Shaving should be avoided in the treated area until it is completely healed. Feel free to shower 2 hours after treatment, but take care to avoid high pressure water hitting the treated area. Baths, hot tubs, swimming pool, or any form of soaking aren’t recommended until all blistering and scabbing are completely healed, as they may increase the risk of infection. Exercise is generally safe after treatment, taking into account the other after care instructions provided here. Wear a sun block with an SPF of 25 or higher over the area for 3 months following the treatment. Do not wear makeup or any cream or medication on or near the treated area unless recommended by our office for 48 hours. Itching is very common due to the dehydrating effect of the laser treatment. Use Aquaphor, vitamin E ointment, or hydrocortisone cream on the treatment area. If the area looks infected (honey colored crusting and oozing or spreading redness), if you experience an unusual discomfort or bleeding, if any other complications develop, or if you have any questions or concerns, contact the office immediately. Of course, if you have an extreme reaction, call 911 and go to the emergency care facility.